Appatim Eye Drops (Timolol Maleate Eye Drops) is a non-selective beta-adrenergic receptor blocking agent. Its chemical name is (-)-1-(tert-butylamino)-3-[(4-morpholino-1,2,5-thiadiazol-3-yl)oxy]-2propanol maleate (1:1) (salt). Timolol maleate possesses an asymmetric carbon atom in its structure and is provided as the levo-isomer. Appatim Eye Drops (Timolol Maleate Eye Drops), when applied topically on the eye, has the action of reducing elevated as well as normal intraocular pressure, whether or not accompanied by glaucoma. Elevated intraocular pressure is a major risk factor in the pathogenesis of glaucomatous visual field loss. The higher the level of intraocular pressure, the greater the likelihood of glaucomatous visual field loss and optic nerve damage. The onset of reduction in intraocular pressure following administration of timolol maleate can usually be detected within one-half hour after a single dose. The maximum effect usually occurs in one to two hours and significant lowering of intraocular pressure can be maintained for periods as long as 24 hours with a single dose. Repeated observations over a period of one year indicate that the intraocular pressure-lowering effect of timolol maleate is well maintained. The precise mechanism of the ocular hypotensive action of timolol maleate is not clearly established at this time. Tonography and fluorophotometry studies in man suggest that its predominant action may be related to reduced aqueous formation. However, in some studies a slight increase in outflow facility was also observed. In a study of plasma drug concentration in six subjects, the systemic exposure to timolol was determined following twice daily administration of timolol maleate ophthalmic solution 0.5%. The mean peak plasma concentration following morning dosing was 0.46 ng/mL and following afternoon dosing was 0.35ng/mL. In controlled multiclinic studies in patients with untreated intraocular pressures of 22 mmHg or greater, timolol maleate ophthalmic solution 0.25 percent or 0.5 percent administered twice a day produced a greater reduction in intraocular pressure than 1, 2, 3, or 4 percent pilocarpine solution administered four times a day or 0.5, 1, or 2 percent epinephrine hydrochloride solution administered twice a day. In these studies, timolol maleate was generally well tolerated and produced fewer and less\ severe side effects than either pilocarpine or epinephrine. A slight reduction of resting heart rate in some patients receiving timolol maleate (mean reduction 2.9 beats/minute standard deviation 10.2) was observed. 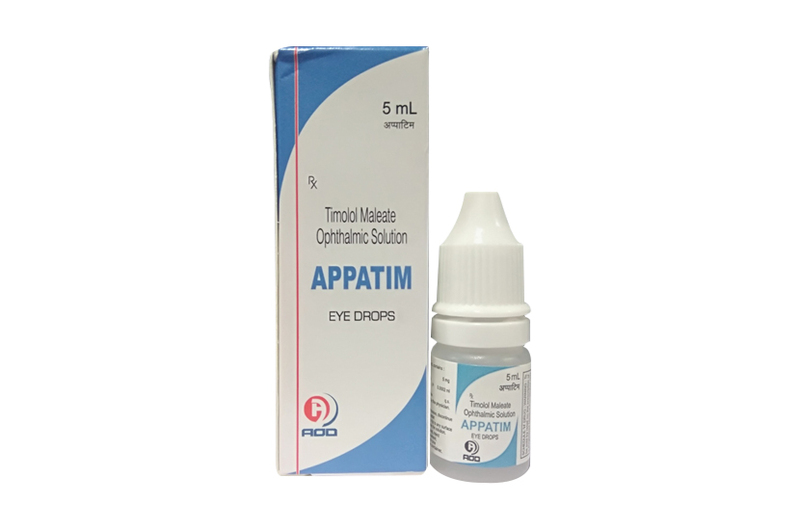 Appatim Eye Drops (Timolol Maleate Eye Drops), is indicated in the treatment of elevated intraocular pressure in patients with ocular hypertension or open-angle glaucoma. Appatim Eye Drops (Timolol Maleate Eye Drops) is contraindicated in patient with overt heart failure, cardiogenic shock, sinus bradycardia,second-or third-degree atrioventricular block, bronchial or history asthama or severe chronic obstructive pulmonary disease or hypersensitive to any component of this product. In patients without a history of cardiac failure continued depression of the myocardium with beta-blocking agents over a period of time can, in some cases, lead to cardiac failure. Appatim Eye Drops (Timolol Maleate Eye Drops) should be discontinued at the first sign or symptom of cardiac failure. Beta adrenergic blocking agent shuld be administrated with caution on patient subject to spontaneous hypoglycemic or to diabetic patient (especially those with liable diabetes ) who are Receing insulin or oral hypoglycemic agent. Patient suspected of developing thyrotoxicosis should be managed carefully to avoid except withdrawal of beta adrenergic blocking agent which might precipitate a thyroid strom. If irriatation persists or increases on using Appatim Eye Drops (Timolol Maleate Eye Drops) ,discontinue the use and consult the physician. The recommended doses of Appatim Eye Drops (Timolol Maleate Eye Drops) is one drop two time a day or as directed by the physician. Appatim Eye Drops (Timolol Maleate Eye Drops) is supplied in one clear polethylene Bottle packed with printed labelled & cartons and Such 25 Carton Packed in a Shrink Sleeves & corrugated box.